This past Friday and Saturday Tailgators located in the Merivale Mall in Ottawa, Ontario hosted its second annual Summer Shootout. 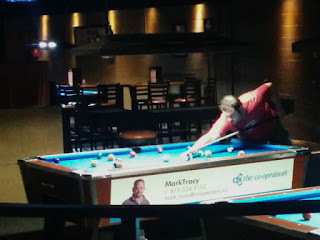 It was an impressive field of 63 who came out to participate in this handicapped bar box 8 ball tournament in the middle of the summer, also known as the off season for cue sports in Canada. This is a testament to the core of players from leagues that co-owners Morgan Bristrow and Curtis Houlden have to draw from. This combined with their reputation for hosting great tournaments almost guarantees big numbers like this at each event they host. Play began around 8:00 pm Friday night after nearly $2400 was raised in the Calcutta. There was not too much to report in the forms of upsets on the first evening of play. Tournament favourites Erik Hjorleifson, Brad Guthrie and Rob Hall all made it through the three rounds played on the winners side. Jody Roy a respected talent on the barbox who went for $120 in the Calcutta, did sustain an unexpected loss in the first round. He was playing Pat Walsh, a player who had to race to 5 games. Roy had to race to 7 games and was blanked in this set 5-0. Roy was a bit flustered afterward, "he missed 2 two shots the whole match" he said when talking about his opponent. going up 5-2. From there he had a few unexpected misses which I took full advantage of eventually winning the match 5-5. He came back strong the next day winning several matches on the losers side. From there I won a few more matches making it to the final 4 on the winners side. This is where my run was abruptly interrupted by my partner here at Cue Sport Nation, Erik Hjorleifson. Other than a few dry breaks I think he missed one shot the whole match. 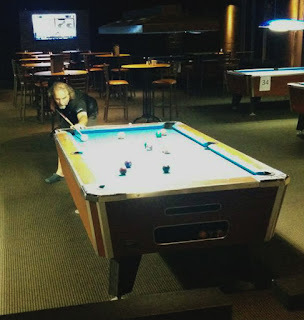 There was an 8 ball he accidentally knocked in out of turn which accounted for 1 of my 2 wins in this set. He had one dry break where the table was open and I ran out. But besides that my break shot was not good enough to compete with his high level of play. After this match I was waiting for a match between Shayne Dickson and the resurgent Jody Roy to wrap up to see who I would play. 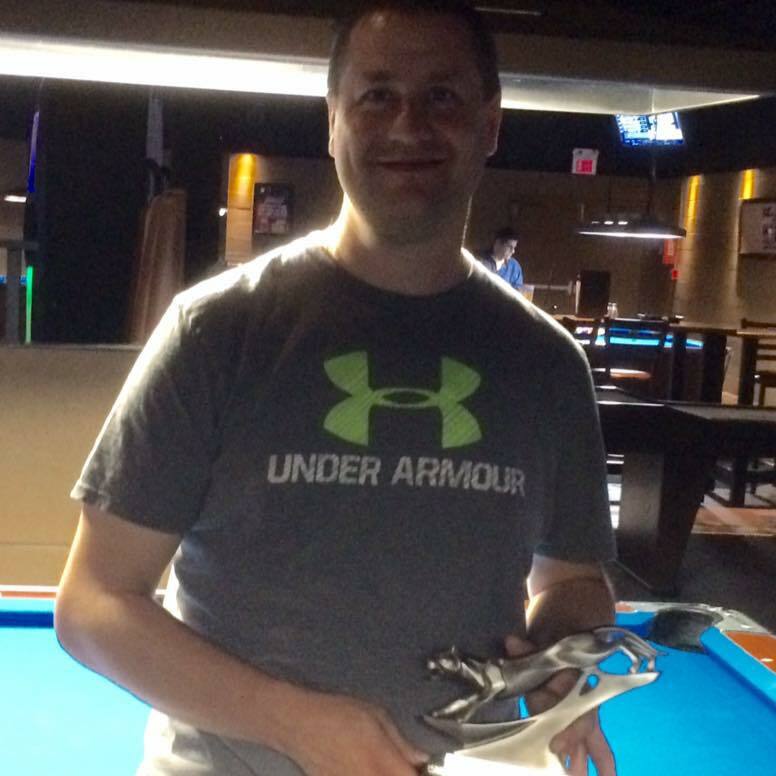 Roy battled back on the losers side all day Saturday with his most notable win against local favourite Dave Cassleman 7-6. Dickson a ranked (6) player who seemingly came out of nowhere ended Roy's bid in 8th pace. He followed this up by ending my tournament hopes as I tied for the 5/6 position with Steve Maclean, another player who fought long and hard on the losers side. Known in many parts of Ontario as the legendary Rob "The Beard" Hall, was waiting for Dickson in the 4th place match. Hall suffered an earlier loss to Brad Guthrie in the final four of the winners side before eliminating Maclean in the 5/6 position. Hall cooled off Dickson winning this match 7-3 earning himself a chance at Hjorleifson in the losers side final. Hjorleifson was the only 8 in this field and spotting Hall 1 game would be no easy feat to accomplish in this short race. After a missed opportunity in the double hill match by Hjorleifson, Hall ran out to win the set 7-7 and earn a rematch with Guthrie. Guthrie who easily dispatch both hall and Hjorleifson earlier on in the tournament looked primed to walk away with the final early, as he went up 4-0. Hall was not done battling back just yet but in the end it was not enough, as Guthrie who was playing at a very high level all weekend went on to win 6-4. Congratulations to Brad Guthrie on his successful trip from the G.T.A to Ottawa and thank you to Morgan Bristrow and Curtis Houlden for hosting another great event. Shooters 8 Ball Update: Fragoso Hangs Tough …!! !